The screenings are followed by a discussion of the health themes raised, led by experts in the field. 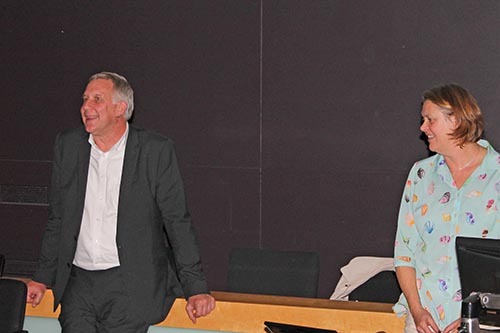 To kick off its 2018/19 season, City's School of Health Sciences Film Club held a screening of Manchester by the Sea. The film provides a harrowing but compelling account of a family’s tragedy over many years and explores the tensions that can exist between individual need and the expectation that family ties may bring. Watching the film is recommended in a blog on the Royal College of Psychiatrists website because Manchester by the Sea "provides a powerful portrait of grief, but additionally adds the complication of both recent and past losses suffered". The screening was followed by a discussion of the health themes raised and which was led by Professor Alan Simpson. He is a mental health nurse researcher at the school with a special interest in the involvement of and collaboration with service users and carers in mental health practice, education and research. The discussion was free-flowing, with the audience able to share their interpretations of the film and what their take home message were. It covered themes including how men in particular deal with grief, current mental health services, and the mental health of those involved in gangs. “Manchester by the sea was chosen for the SHS film club because it portrays the experience of long term grief. Those attending were healthcare students, staff and others directly connected with the activities of the School of Health Sciences, City, University of London. They discussed how those in the film managed their bereavement and the impact on their mental health." This provided a great opportunity to explore complex issues of loss, trauma and deep grief, with students, staff and other people who came along on the night. Watching and discussing a film together provides a different and interesting way to explore mental health issues and, in this case particularly, how men manage and communicate emotions. An award winning documentary illustrating the reality of the social determinants of health directed and produced by Katharine Round. Inspired by the book 'The Spirit Level' the film came about as a way to explore the human meaning of the research presented in the book, and to show, through the film's participants, how we are psychologically affected wherever we stand on the income ladder, and how this can lead to the relationships found in the research. Produced by Ken Loach in 2016, the film opens with the story of Daniel who has suffered a heart-attack at 59, and is struggling with the work capability assessment. In the job centre Daniel meets Katy and her children who applied for housing in London and has been moved to the North East of England because of the availability of housing in the UK. The film shows them visiting a food banks and other places where those who are struggling to maintain health and wellbeing might visit. A story about London teenagers who are granted a day of compassionate leave and what they do with the day. Made in 2006 the film portrays gang culture which is still relevant today. If you're a student at City, you can access support through its Student Counselling and Mental Health Service. If you're a member of staff at City, you can access support through its Occupational Health Service.